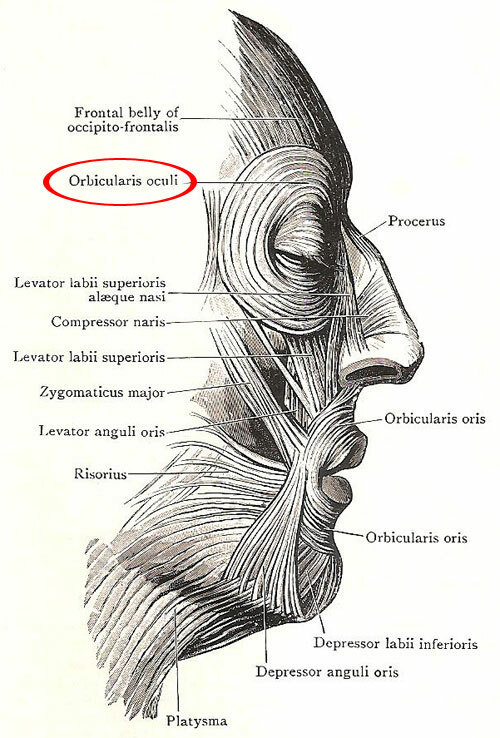 Muscles of the face, including the orbicularis oculi. The orbicularis oculi is a facial muscle that has three parts – an orbital part on and around the margins of the orbital opening; a palpebral part in the eyelids; and a lacrimal part related to the lacrimal gland. The orbital part is the thickest and widest part. It extends laterally into the temple, downwards into the cheek, overlapping the muscles of the upper lip, and upwards into the forehead, where it blends with fibers of the frontal belly of the occipitofrontalis. The fibers of the occipital part arise from the medial palpebral ligament and the adjoining part of the medial orbital margin, sweep in curves round the orbital margin and come back to the same point medially, having no attachment laterally except a loose attachment with the skin. Some of the fibers that arise from the bone above the palpebral ligament are short, and end in the skin of the eyebrow. The palpebral part is paler and thinner than the orbital part. Its fibers also arise from the medial palpebral ligament and the adjoining bone, and sweep round in curves, having no lateral attachment. At its periphery, the palpebral part is continuous with the orbital part. At the margin of each eyelid, a small bundle is partially isolated, and is called the ciliary bundle because it lies close behind the roots of the eyelashes. The lacrimal part is a small thin sheet that arises from the posterior margin of the lacrimal fossa and the facial sheath of the lacrimal sac, curves forwards round the lateral side of the lacrimal sac, and divides into slips that run laterally in the eyelids. The firm connections of the muscle are at the medial corner of the eye; therefore, when it contracts, it draws the skin and the eyelids medially, and thus promotes the flow of the lacrimal fluid medially towards the lacrimal canaliculi. The palpebral part can contract independently to close the eye lightly, as in sleep and in blinking. The orbital part also can contract independently, screwing up the skin around the eye to give it partial protection from a bright light or wind and rain; and those of its fibers that are inserted into the skin of the eyebrow draw the eyebrow down in frowning, and draw the eyebrows closer together, producing one or more vertical furrows in the middle of the forehead. Both parts contract firmly to protect the eye from an unexpected bright light or sudden danger. They contract firmly also during strong expiratory efforts – a spasm of coughing, hearty laughter, the crying of a child. This is probably to compress the contents of the orbit and prevent over-distension of the orbital veins. The lacrimal part helps the palpebral part to draw the eyelids medially; by its connection with the facial sheath of the lacrimal sac it probably dilates the sac and widens the openings of the canaliculi.